Dental caries is the scientific term for tooth decay or cavities. Caries is caused by specific types of oral bacteria. In presence of sugars, these bacteria produce acid which destroys the tooth's structure. Simple sugars in food are these bacteria's primary energy source. Thus a diet high in simple sugar is a risk factor. 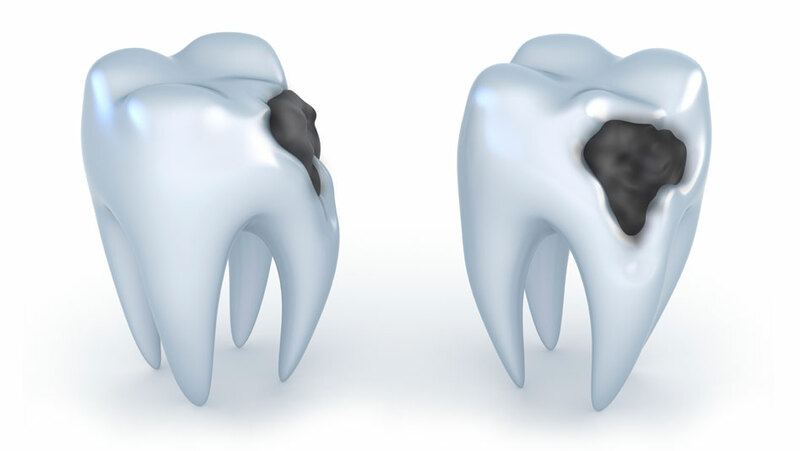 Dental caries can occur on any surface of a tooth that is exposed to the oral cavity. Different individuals are susceptible to dental decay to different degrees depending on the shape of their teeth, oral hygiene habits, and the buffering capacity of their saliva. If you suspect you have dental decay, call us today on 0395570957 without delay to schedule an appointment. I have no pain: No Caries? According to the World Health Organization, around 2.43 billion or 36% of the population have dental caries. The disease is more common in the developed world due to higher sugar consumption. Children and pregnant women are more susceptible to dental decay due to their more frequent snacking habits and higher sugar intake. People with reduced salivary flow are also more susceptible because the protective buffering capacity of their saliva is reduced. Individuals with Diabetes Mellitus, Sjogren's syndrome and people taking some medications are at a greater risk. Antihistamines, antidepressants and some blood pressure controlling medications decrease saliva production. Before a cavity forms, the process is reversible. However, once a cavity forms, the lost tooth structure cannot be regenerated, and a filling is required. I have no pain: Does it mean I have no Dental Caries? A person experiencing caries may not be aware of the disease. The earliest sign of a new carious lesion is the appearance of a chalky white spot on the surface of the tooth. It is called a white spot lesion or microcavity, and is indicative of demineralization or loss of minerals from the tooth enamel. As the lesion continues to progress, it can change colour (to brown or even black), and will eventually turn into a cavity. A tooth weakened by extensive internal decay can also suddenly fracture under normal chewing forces. Untreated decay leads to discomfort and difficulty eating, as well as bad breath and foul taste. Pain, worsening with exposure to heat, cold or sweet foods and drinks, is often present. Complications of untreated caries include severe pain, swelling, infection or abscess, tooth loss and inflammation and infection of the surrounding tissues. More severe complications such as Cavernous sinus thrombosis and Ludwig angina can be life-threatening. Prevention includes regular professional cleaning of teeth, a diet low in sugar, and small amounts of fluoride. Brushing two times a day and flossing is recommended. Treating a mother's dental caries may decrease the risk in her children by decreasing the numbers of certain bacteria. Screening can result in earlier detection.